Late 1900s-early20th C, hippo ivory. 7″ long. Good proportionate body superbly carved, finely incised details; signed. In Old China, doctor dolls were used in a physician’s office for a female patient to indicate what part of the body she was hurting. 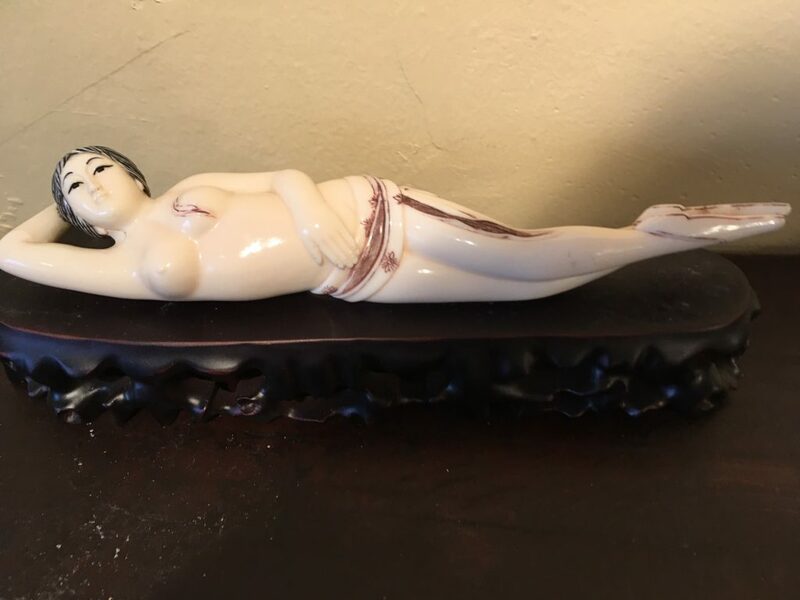 This lady doll came out of China in the 1900s, but it was carved by a master Japanese carver. It was chosen for its dainty beauty. She is superbly carved with finely incised details. She reclines on an elaborately carved rosewood stand, wearing only a loin cloth with floral motifs etched in maroon color covering her private part, and a pair of slippers outlined in same color. Her long black hair is bunched and tied at her nape. Her oval face has delicately carved features with eyebrows and eyes finely etched in black. The figure can be lifted off the stand. This is a signed piece by a master Japanese carver.